On Friday March 23, 2018 over 375 students at Lawton C. Johnson Summit Middle School participated in the school’s 3rd annual NJ Makers Day event. School librarians Megan Hartley and Beth Thomas, the event organizers, planned 19 high and low tech stations that encouraged students to tinker and create in a low-stress environment. This year’s event featured six new stations, including Keva Planks, which were purchased with a mini grant from NJ Stem Pathways and the Overdeck Family Foundation. 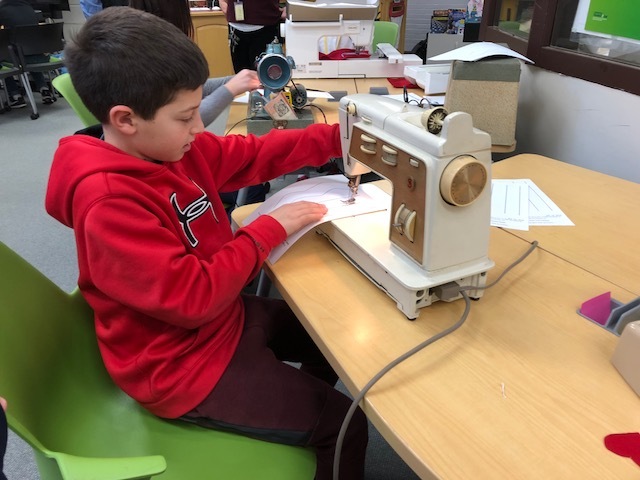 Students had a blast experimenting with circuits, creating bracelets with paper beads, and even sewing with some antique sewing machines! The day was truly a team effort – ten teachers brought in their classes, two staff members and the library intern ran stations, the librarians facilitated, the cafeteria provided boxes for the cardboard challenge, and the students tapped into their imaginations to make it a Makers Day to remember!